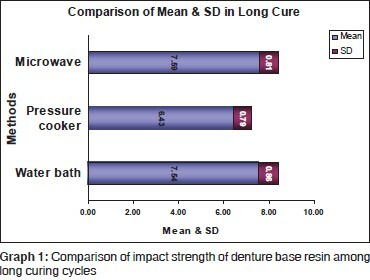 Aim : To measure the impact strength of denture base resins polymerized using short and long curing cycles by water bath, pressure cooker and microwave techniques. Materials and Methods: For impact strength testing, 60 samples were made. The sample dimensions were 60 mm × 12 mm × 3 mm, as standardized by the American Standards for Testing and Materials (ASTM). A digital caliper was used to locate the midpoint of sample. The impact strength was measured in IZOD type of impact tester using CEAST Impact tester. The pendulum struck the sample and it broke. The energy required to break the sample was measured in Joules. Data were analyzed using Student's " t" test. 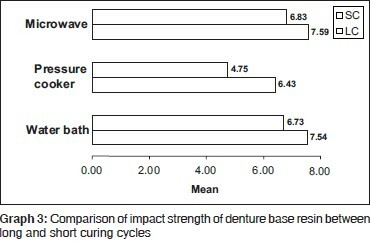 Results: There was statistically significant difference in the impact strength of denture base resins polymerized by long curing cycle and short curing cycle in each technique, with the long curing processing being the best. Conclusion: The polymerization technique plays an important role in the influence of impact strength in the denture base resin. This research demonstrates that the denture base resin polymerized by microwave processing technique possessed the highest impact strength. Poly(methyl methacrylate) (PMMA) polymers were introduced as a denture base material in 1937. Since its inception, acrylic resin denture base material has been studied extensively for its physical, mechanical and chemical properties. These materials are low in strength, resulting in denture fractures. The fracture of acrylic resin dentures is an unresolved problem in Removable Prosthodontics despite numerous attempts being made to determine its causes. Fracture may occur because of unsatisfactory transverse, impact, flexural fatigue strength. The fracture of the denture occurs usually out of the mouth, and is a high-strain-rate fracture due to the denture being dropped on the floor, or bent and fractured in cleaning. Rarely does a complete denture break in the mouth. Impact strength is a measure of the energy absorbed by a material when a sudden blow strikes it. Ideally, the denture base should have sufficiently high impact strength to prevent breakage on accidental dropping. Numerous factors have been accounted for influencing impact strength and the effects of residual monomer content. The processing technique used to polymerize the denture base resin has been found to be an important factor. Therefore, a need was felt to assess the influence of curing variables on the impact strength of acrylic resin denture base material. The water bath processing technique has been the most conventionally used technique. In spite of many advantages of this technique like ease of polymerization, simplicity and cost-effectiveness, a major disadvantage is the long processing time required. There has been in a constant quest for faster and newer techniques. Muley first reported pressure cooker polymerization technique which was further investigated by A. B. Sidhaye and J. H. Undurwade. 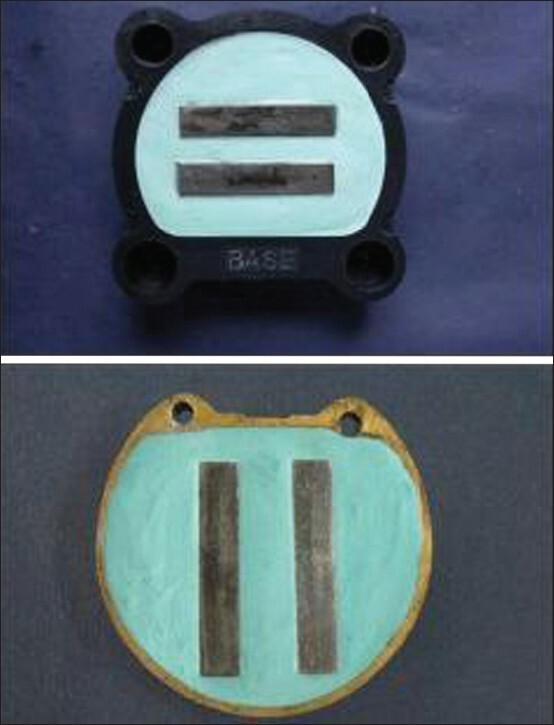 Conventional acrylic resin material can be used for this technique. 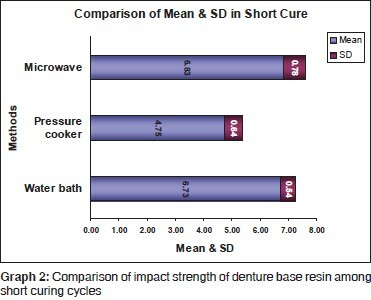 Impact strength is an important characteristic of the denture base resin; therefore, this investigation will evaluate and compare the impact strength of denture base resins polymerized by the conventional water bath, microwave and pressure cooker polymerization techniques. This in vitro investigation was designed to measure the impact strength of denture base resins polymerized using long cure polymerization and short cure polymerization cycles by waterbath, microwave and pressure cooker techniques [Figure 1], [Figure 2] and [Figure 3]. For impact strength testing, 60 samples were made. 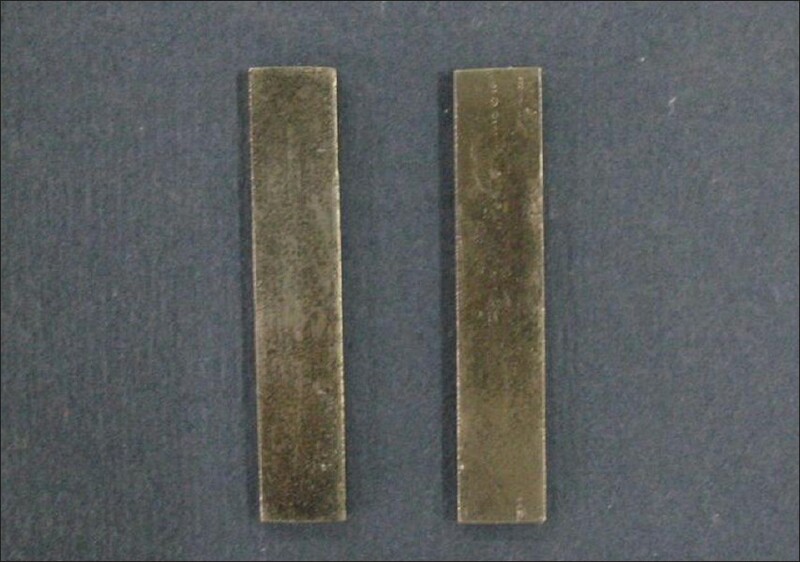 The sample dimensions were 60 mm × 12 mm × 3 mm, as standardized by the American Standards for Testing and Material (ASTM) [Figure 4] and [Figure 5]. For qualitative and quantitative analysis of residual monomer, the same specimens were used after testing for impact strength. The long curing cycle involved polymerization of denture base resin in a constant temperature water bath at 74°C (165°F) for 8 hours with no terminal boiling. The short curing cycle involved polymerization of the resin at 74°C for 90 minutes in a water bath and then increasing the temperature of the water bath to 100°C and processing for 30 minutes at 100°C. Ten samples were cured using water bath long cure and 10 samples were cured using water bath short cure method. For microwave polymerization technique, the same standardized procedure for formation of the mold and packing was used. A domestic microwave oven of 2450 MHz frequency was used for the polymerization. The long curing cycle involved polymerization of the resin for 10 minutes at 540 W, as recommended by the manufacturer. 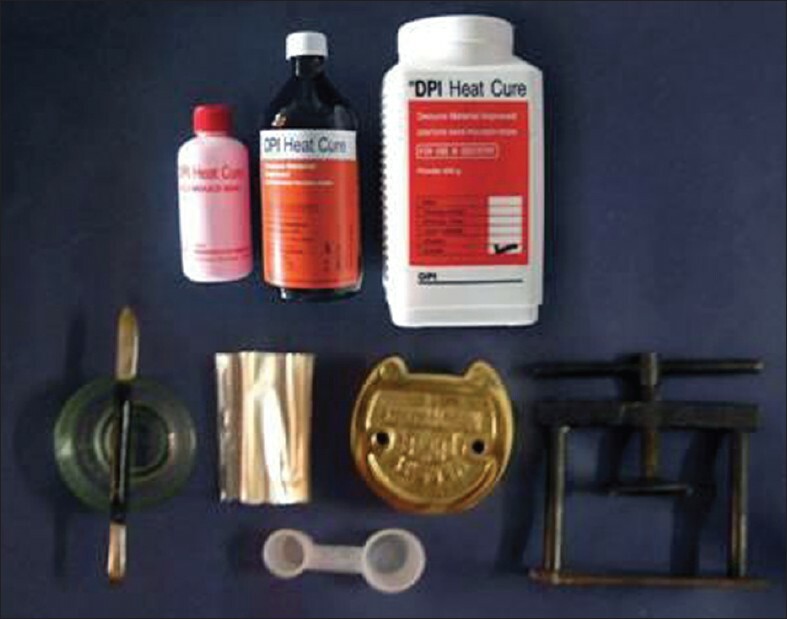 The short curing cycle involved polymerization of the resin for 7 minutes at 600 W. Ten samples were cured using microwave long cure and 10 samples were cured using microwave short cure method. The flasking, [Figure 6] mixing of the resin and then packing of the mold were all done according to the standardized procedure, which is the same as that followed for the water bath technique. A 6-l capacity domestic pressure cooker was filled with 250 ml of water and kept on the gas flame to boil. The lid was placed without locking. As the water started boiling at 100°C, the clamped flask with acrylic resin was packed into it, placed in the boiling water and the lid was locked in position. When the pressure inside the cooker reached 760 mm Hg, which was indicated by a low, continuous whistle, the flame was reduced and the pressure was maintained. For the long curing cycle, the pressure was maintained for 30 minutes. The flame was then turned off and the cooker was allowed to cool for 10 minutes so that the lid could be opened. Thus, the total time that the flask was subjected to a temperature above 100°C was 40 minutes for the long curing cycle. For a short curing cycle, the pressure was maintained for 20 minutes from the time the flame was reduced after the low hissing sound of the whistle. The flame was turned off after 20 minutes and the cooker was allowed to cool for 10 minutes. Therefore, the total time the flask was above 100°C was 30 minutes. Ten samples were cured using pressure cooker long cure and 10 samples were cured using short cure method. 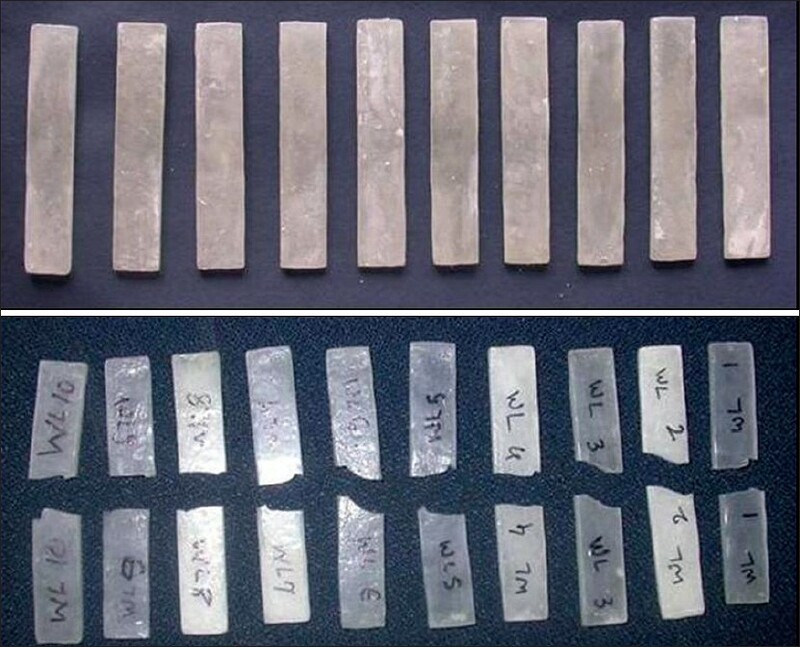 The samples recovered from the flasks after polymerization were finished and polished. The finished and polished samples were stored in water at room temperature for 24 hours. The study was carried out to analyze the effect of processing time (long cure and short cure) and technique (conventional heat cure water bath polymerization, microwave polymerization, pressure cooker polymerization) on denture base resin. The assessment of important properties like impact strength and quantitative and qualitative analysis of residual monomer were done. These data obtained were statistically analyzed. It can be seen from [Table 1] that there was a significant difference in the impact strength obtained by the long cure and short cure in all three methods (P<0.05). It could be concluded that long cure processing technique was better than short cure processing technique for polymerization of denture base resin. There was significant difference between water bath processing technique and pressure cooker processing technique (P<0.05). It shows that water bath curing technique was better than pressure cooker curing technique. There was no significant difference in the impact strength values obtained by water bath curing technique and microwave curing technique (P>0.05). There was significant difference in the impact strength values obtained by pressure cooker curing technique and microwave curing technique (P<0.05). It shows that microwave curing technique was better than pressure cooker curing technique. [Graph 1] was obtained on statistical analysis of samples cured by long cure cycles of water bath, microwave and pressure cooker for impact strength. This shows that microwave long cure had better impact strength as compared to water bath long cure and pressure cooker long cure. But the difference between microwave long cure and water bath long cure was not statistically significant, whereas the difference between microwave long cure and pressure cooker long cure or water bath long cure and pressure cooker long cure was statistically significant. [Graph 2] was obtained on statistical analysis of samples cured by short cure cycles of water bath, microwave and pressure cooker for impact strength. This shows that microwave short cure had better impact strength as compared to water bath short cure and pressure cooker short cure. But the difference between microwave short cure and water bath short cure was not statistically significant, whereas the difference between microwave short cure and pressure cooker short cure or water bath short cure and pressure cooker short cure was statistically significant. [Graph 3] shows the comparison of mean between water bath long cure, microwave long cure, pressure cooker long cure and water bath short cure, microwave short cure and pressure cooker short cure. This graph shows that in all three curing methods, long cure cycle was better than short cure cycle. Impact strength in long curing cycle was greater than in short curing cycle regardless of the processing technique [Table 3]. The samples were subjected to IZOD type of impact tester using CEAST Impact tester. The energy required to break the sample was measured in Joules. There was significant difference in the impact strength obtained by the long cure and short cure in all three methods (P<0.05) [Table 4]. It could be concluded that long cure processing technique was better than short cure processing technique for polymerization of the denture base resin. [Graph 3] shows that in all three curing methods, long cure cycle was better than short cure cycle. Impact strength in long curing cycle was greater than in short curing cycle. PMMA has been used as a denture base material for more than 70 years. The properties that have contributed the most to the success are excellent appearance, simple processing and easy repair. An inherent disadvantage is the liability of an acrylic resin to break as a result of fatigue failure in the mouth or impact failure outside the mouth. Porosity and residual monomer decrease the impact strength. Processing technique has been found to have profound influence on the impact strength. Through years, the water bath heat processing technique has been the most widely used polymerization technique. It is an easy, simple to handle and a cost-effective procedure. The water bath heat processing technique involves the activation of the initiator, i.e. benzoyl peroxide, creating the first free radicals which start the polymerization. The temperature required to generate free radicals is above 60°C (140°F). The exothermic polymerization reaction increases as the temperature increases. At 100.8°C (3213.4°F), the methyl methacrylate boils and creates porosities in the resin. This is because as the exothermic reaction progresses, heat is liberated which does not escape easily due to the unfavorable thermic gradient. As the heat cannot be directly produced in the denture base material inside the mold, heat has to be produced indirectly by the heating up of the water. The heat dispersion is low and may result in voids in the denture base resin. To control this thermic gradient, it is necessary to polymerize the denture base resin at a much slower rate, approximately 8 hours for complete polymerization. The relatively longer time required for processing is a major disadvantage of the water bath polymerization technique. To compensate for this disadvantage, a faster or a short curing cycle was introduced. The high level of residual monomer content and porosity in denture base resins polymerized by this technique has been a frequent problem. This research demonstrates that the impact strength of denture base resins polymerized by this technique is inferior when compared to denture base resins polymerized using a long curing cycle or alternative polymerization procedures. The microwave polymerization technique evaluated in this research was first introduced by Nishii et al. in 1968. The polymerization procedure by this technique takes less than 10 minutes, which has been claimed as a major advantage. Studies also have reported better dimensional accuracy,  transverse strength, , lesser residual monomer content and porosities  of microwave polymerized denture base resin. In this technique, microwaves are used to generate heat inside the resin. The microwaves are electromagnetic waves produced in the microwave oven. Domestic microwave ovens can be used for this purpose, which uses a frequency of 2450 MHz. It gives a wavelength of about 12 cm (5 inches). The methyl methacrylate molecules orient themselves in the electromagnetic field of the microwave and their directions change nearly 5 billion times in a second. The numerous intermolecular collisions that occur cause rapid heating, and therefore less time is required for the polymerization. As the temperature increases, the number of monomer molecules decreases and the residual monomer content is reduced to a minimum. The polymerization heat is dissipated more effectively, faster and with lesser risk of porosity. T1 = boiling point at P1. Using this formula, the boiling point of methyl methacrylate resin was calculated to be 128°C at 1520 mm Hg in the pressure cooker. This is 3°C more than the temperature at which the strips were cured. This fact supports the hypothesis that pressure plays an important role in accelerating the initial polymerization. 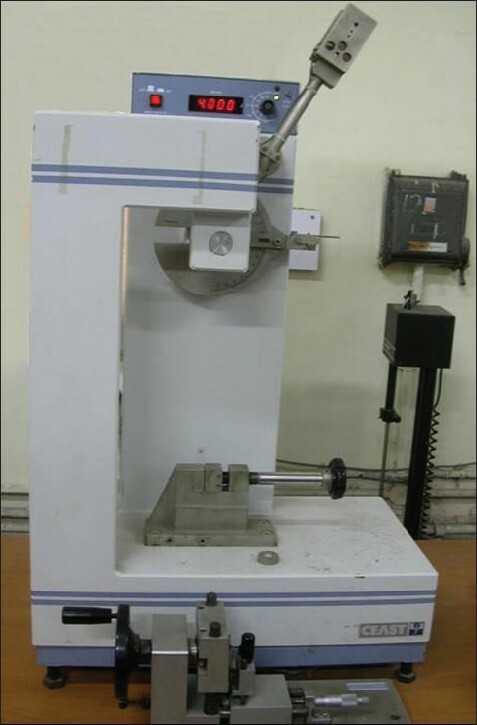 For testing impact strength, IZOD type of impact tester (CEAST impact tester) was used. The energy required to break each sample was calculated in Joules and the impact strength was calculated. The findings of this research demonstrate that the samples processed by a long curing cycle in a microwave possessed the highest impact strength values when compared to samples processed by water bath and pressure cooker processing techniques. The microwave processing technique produced samples with higher impact strength values, but the difference was not statistically significant when compared to the water bath technique. The water bath technique produced samples with higher impact strength values when compared to pressure cooker processing technique. The difference is statistically significant. The type of polymerization technique plays an important role in influencing the impact strength of denture base resin. The microwave polymerization technique produced denture bases with highest impact strength. The water bath polymerization technique also produced equally good results. In all the techniques, the long curing cycle proved to be better in producing denture bases with higher impact strength as compared to short curing cycle. We would like to thank Dr. C. V. Avdhani, Dr. Prakash Wadgaonkar, and Dr. Harshawardhan Pol from National Chemical Laboratory and Dr. Rahul Prasad from Bharati Vidyapeeth Dental College and Hospital for their help. 1. Craig RG. Restorative Dental Materials. 10 th ed. St Louis: Mosby; 1996. p. 500. 2. Beyli MS, Dent ME, Fraunhofer JA. An analysis of causes of fracture of acrylic resin dentures. J Prosthet Dent 1981;46:238-41. 3. Yazdanie N, Mahood M. Carbon fiber acrylic resin composite: An investigation of transverse strength. J Prosthet Dent 1985;54:543-7. 4. Stafford GD, Huggett R, MacGregor AR, Graham J. The use of nylon as a denture-base material. J Dent 1986;14:18-22. 5. Reitz PV, Sanders JL, Levin B. The curing of denture acrylic resins by microwave energy: Physical properties. Quintessence Int 1985;8:547-51. 6. Undurwade JH, Sidhaye AB. 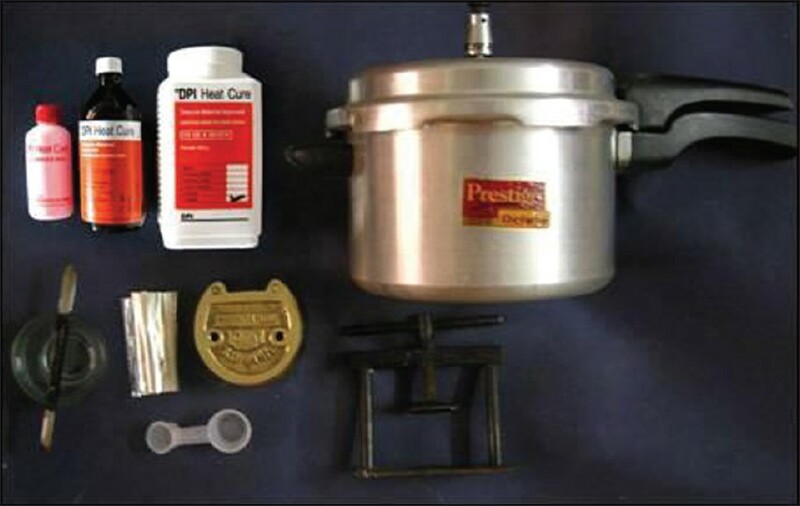 Curing acrylic resin in a domestic pressure cooker: A study of residual monomer content. Quintessence Int 1989;20:123-9. 7. De Clerk JP. Microwave polymerization of acrylic resins used in dental prostheses. J Prosthet Dent 1987;57:650-8. 8. Schreiber CK. Polymethylmethacrylate reinforced with carbon fibers. Br Dent J 1971;130:29-30. 9. De Clerk JP. Microwave polymerization of acrylic resins used in dental prostheses. J Prosthet Dent 1987;57:650-8. 10. Takamata T, Setcos JC, Phillips RW, Boone ME. Adaptation of acrylic resin dentures as influenced by the activation mode of polymerization. J Am Dent Assoc 1989;119:271-6. 11. Al Doori D, Huggett R, Bates JF, Brooks SC. 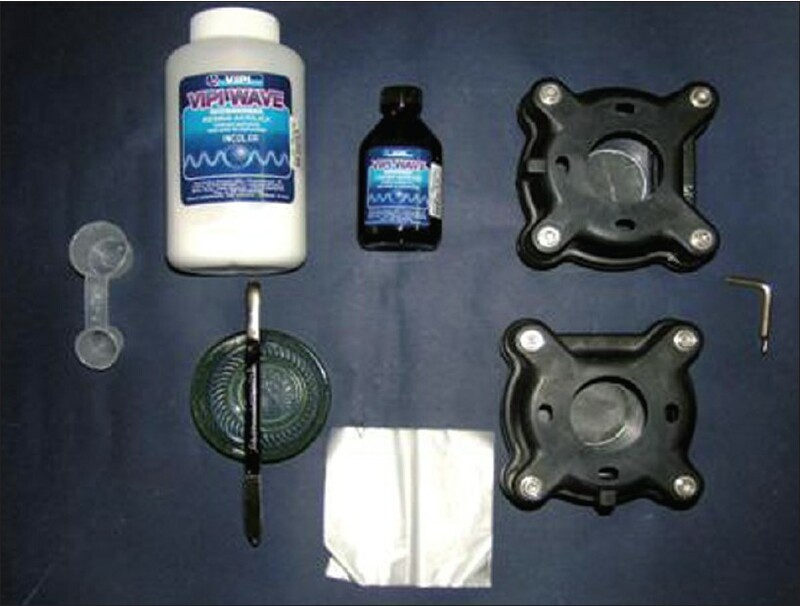 A comparison of denture base acrylic resins polymerized by microwave irradiation and by conventional water bath curing systems. Dent Mater 1988;4:25-32. 12. Barden M, Davy KW, Parker S, Ladizesky NH, Ward IM. Denture base poly(methyl methacrylate) reinforced with ultra-high modulus polyethylene fibers. Br Dent J 1988;164:109-13.